The simple recipe that follows makes approximately 32 of these cookies. I use a small ice cream scoop, about 1-tablespoon of batter for each cookie and they bake up roughly 2 1/2 inches in diameter. For the icebox cake, bake them until browned and set in the middle, 14 to 16 minutes, to ensure they are nice and crisp. I used about 4 cookies per cake layer. With 5 layers, that means about 20 cookies are needed in total. I'd bake up a couple of extra just in case but for the remaining ten or so, you could adjust the bake time if you'd like a different texture. For softer cookies (that are very pleasantly chewy in the center), bake for about 2 minutes less; they were very tasty that way. For the cocoa whipped cream with mascarpone filling, I start with 1 cup of cold cream and I used 5 ounces of mascarpone cheese. I took it straight from the fridge, cold. All the ingredients get placed in the stand mixer and the filling whips up very quickly. To assemble is just a matter of placing the chocolate chip cookies down into the bottom of your cake pan (either springform with removable sides or a cheesecake pan like I use with a removable bottom that simply slides out). Lay down as many cookies as you can so it sits flat against the cake pan. You can probably fit just three that way. Then, break up another cookie to fill in some of the bigger empty spaces. Divide the cream filling into fifth and place one portion over the top of the cookies. * Here's something of a tip: I found that even after an overnight sitting in the fridge, the bottom-most layer of cookies was a little hard to slice through. It's not a big deal but if you want the bottom layer to be softer, I'd recommend spreading a thin layer of the cream filling onto the bottom of the pan before placing the first layer of cookies on top. Then, just repeat to make a total of 5 layers of chocolate chip cookies and cream filling, each. End with a final layer of cream and smooth the top. Cover your assembled cake with plastic wrap and refrigerate overnight. You really need the overnight sit in the fridge for the cookie layers to soften properly. Also, the creamy filling has a chance to mellow and meld with everything and just tastes better the longer it "rests" in the fridge. I made mine one day ahead and we cut into our first slice the following evening. We had leftovers for the next 2 nights and I can tell you the cake held up very well, the cookies were nice and soft without being overly soft or mushy (as I feared). If you're in the mood to indulge in an icebox cake, consider this one. And if you want to save some time and use some store-bought cookies, I'm all for it. Make cookies: Preheat oven to 350 degrees, with racks placed in the upper and lower thirds. Line 2 baking sheets with parchment paper or silicon mats. In a bowl, whisk flour, baking soda, and salt together. In a stand mixer, beat butter and sugars on medium-high speed until pale and fluffy, about 2-3 minutes. On low-speed, add egg and mix until combined. Scrape bowl and add flour mixture in 3 batches. Beat in vanilla and fold in the chocolate chips. Use a small ice cream scoop (1-tablespoon measure) and scoop dough onto lined baking sheets, placed about 2 inches apart. Bake, rotating pans halfway through the bake time, until edges are golden brown and centers are set, about 14 to 16 minutes. Note: you want thin, crisp cookies for the icebox cake. (If desired, you could set some cookie dough aside and bake soft, chewy cookies by reducing the bake time by about 2 minutes. You will need 20-22 cookies for the cake, leaving you with about 10 extra to bake as you like.) Let cookies cool completely on wire racks. Make cream filling: Place heavy cream, mascarpone, sugar, cocoa, and vanilla into the bowl of a stand mixer fitted with the whisk attachment. Start on low speed, then gradually increase to medium high and whip until cream forms firm peaks. Assemble cake: To make the icebox cake, arrange a flat layer of chocolate chip cookies on to the bottom of a 6-inch round springform or cheesecake pan (either with removable sides or bottom). Break off some chocolate chip cookies to fill in empty spaces in between. You will likely only be able to fit 3 whole cookies and break off pieces from a fourth to fill in spaces for each layer. Divide cream roughly into fifths and place one portion over the cookies. Spread evenly and all the way to the edge of the cake pan. Repeat with another layer of cookies, then cream, until you have 5 layers of each, ending with a layer of cream. Cover the cake pan with plastic wrap and refrigerate overnight. This will allow cookies to soften into cake layers and the flavors to meld. Before serving, run a knife around the edge of the cake pan and remove the sides of the pan. Set onto a serving place, garnish the top of the cake with shaved chocolate and serve cold. Leftovers can be wrapped and stored in the refrigerator for up to 2 days. Oh, but I'm sure the homemade cookies made your icebox cake even more delicious. This looks fantastic! That was the wishful thinking/idea. Chocolate chip cookies are so easy to make so why not. Thank you! Beautifully creative Monica. I've only made one ice box cake - and those were actually small stacks - but I couldn't stop eating them. That would be dangerous in my house! I love everthing about it. The cookies look wonderful. Have a great day! By the way - your photos are outstanding. Thanks, Tricia. I find the same with this...just can't stop eating it so best to put a small sliver on your plate! Oh my - this is a gorgeous looking cake. I love the cookies in it! Thanks, Marie. It's great for a gathering. I love the idea of using crisp chocolate cookies in between. The cake looks fabulous! I've never seen a cake with layers of cookies. How brilliant! I would need another batch of cookies so I can make the cake while I eat those yummy looking cookies... otherwise my cake would be flat, with 2 layers. LOL. Always love pinning your desserts. They are beautifully made. It sounds kind of odd but it dangerously tasty. : ) Thanks for the kind words, Nami. I have made this cake before! Easy and absolutely delicious! Yours look perfect! With your homemade cookies, that cake is even better. Gotta make my own cookies next time too! 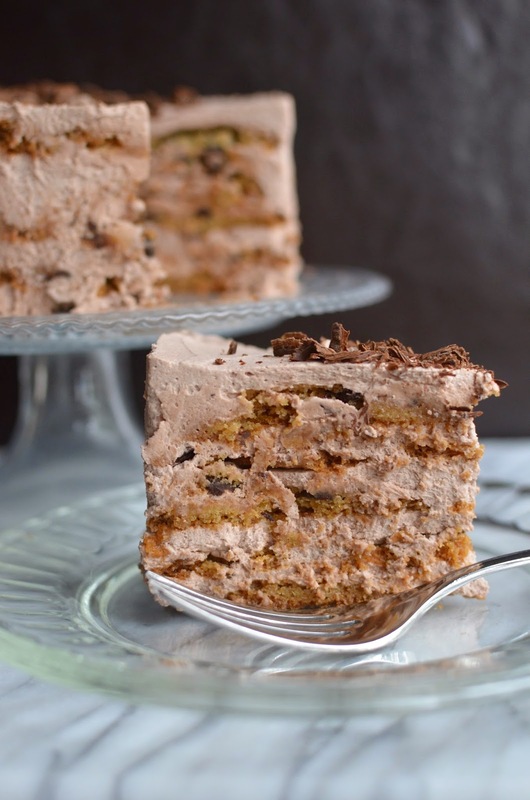 Yay - I've wanted to try this since my friend mentioned Ina's mocha icebox cake with the chocolate chip cookies. Glad you like it too! I figure I'm saving some money by making the cookies at home. I thought about using the published Tate's recipe but I hear it doesn't compare to the ones you buy. I am drooling over this cake, Monica. It looks gorgeous! I bought mascarpone today to make dessert tomorrow with grilled peaches but now I am thinking to make this cake. I love the crunchy chocolate chip cookies layers with whipped cream. Is the cake easy to remove from the tin? I've actually never attempted an icebox cake before! I kind of love that you made your own cookies for it...definitely something I would do! Really? You would make a terrific version, I'm sure! I love that you added homemade cookies to this! Extra work but soo worth it I'm sure! This looks delicious! 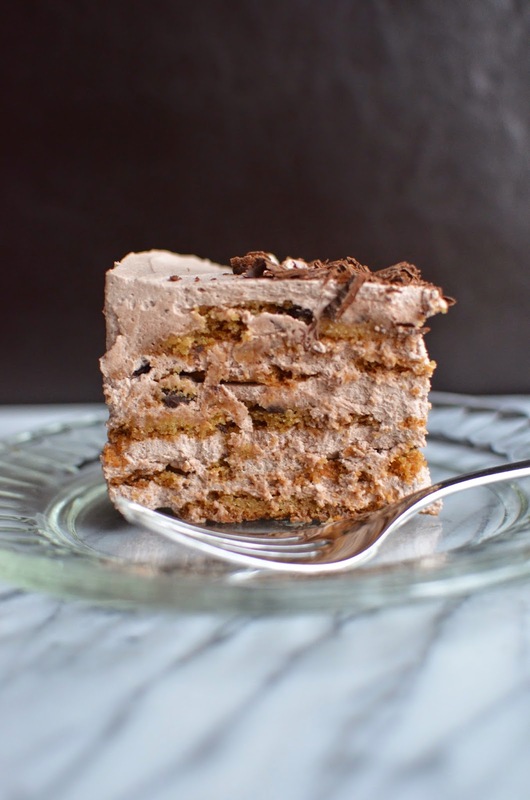 I haven't seen cookies in an ice box cake but I love the idea. Any kind of ice cream cake gets an A in my book, and these pictures are making me hungry for dessert already! Those cookies look perfect and the whipped cream and mascarpone filling sounds amazing. I can only imagine how heavenly it tastes! It was an excuse to make some crisp choc chip cookies for a change. Thanks, Christin. This cake is so cute! Very ambitious to make your own cookies first ;) Looks totally delicious, Monica! I love how you said that, Jo, because that's exactly what this blog is all about. I experiment with recipes/ideas that catch my eye and figure out if it's as good as it looks or sounds. : ) Thanks for your sweet comments. This cake is amazing!!!! I seriously want this! Thanks, Consuelo! Hope you are having a lovely weekend, too!